Difference between revisions of "New Player Guide"
Never made a character before? Check out the [[Character Creation]] page. 1 New Player Guide: Your first day in the world of UO Roleplay! New Player Guide: Your first day in the world of UO Roleplay! Welcome friend! We are very glad to have you joining us. You will find the sandbox game world vast, enjoyable, and full of many surprises! We wanted to give you a few tips to help you get started on your journey. First time playing? 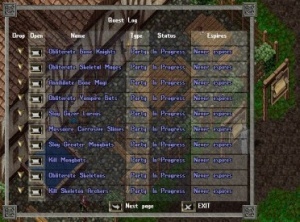 This page is a great start, but more basics can be found about the interface and basic controls of Ultima Online here. Never made a character before? Check out the Character Creation page. When you start out you will be given basic equipment that will aid you in your adventures. A good place to start is by looking for Quest givers. These NPC will greet you and then ask you if you wish to except a quest form them. You will need to type ‘quest’ to have the quest dialog open up. Completing these fist few newbie quests is very beneficial for several reasons. The first being that they will teach you how to use the quest system. 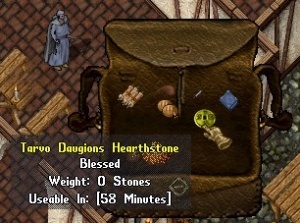 And secondly one of the quests rewards will be a Hearth Stone! Hearth Stones are items that can be marked in an Inn or house and will allow you to recall to that location an unlimited amount of time. You can re-mark the Hearth Stone at any time. When you right click on your character you will see a option called ‘My Stats’. This gump will give you lots of very useful information about your character including your race/class/alignment! As you play your character's hunger and thirst levels drop, which will cause the rate at which you gain skill to decrease if they fall below 16. Below can be found information about other items or actions that can be preformed by characters. This information will be helpful for new players to know about. Buy from Provisoners. Double click to claim, double click again to mark in a Inn or House. Magic items are often unidentified. Use a Identification Scroll on them to find out what they are! Say "Repair" to Blacksmith, Tailors, and Tanners to repair items. Target items and drop gold onto NPC. Use skill Arms Lore (Animal Lore on pets) on an item to open the socket gump. Click a socket slot then target a gem. Use a socket augment hammer to remove the gem (some gems can not be removed). Some items can be destroyed (such as locked door in dungons). Equip a weapon, double-click the weapon and target a item that can be destroyed. Double click a treasure piles to look for treasure. Double click a trash piles to look for items. Double click a item in your backpack to equip it. 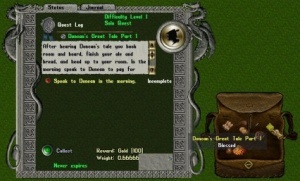 An example of a quest gump. Quest Boards are a place to get quests. 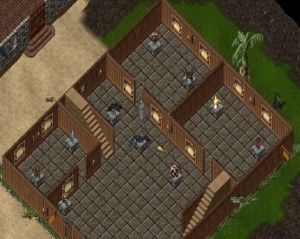 When you first enter the world of UO Roleplay you will find your self in The Black Fox Inn. Your first task will be to make your way through the inn to the inn keeper Duncan Bartram. You will notice his name says 'Duncan Bertram, The Tavern Keeper [Quest]'. The [Quest] at the end of the name indicates that this NPC has a quest for you. Walk up to him and after your read what he has to say type “quest” and push enter. The quest gump will open up for you. You can see the quest title, read the quest text, and either accept the quest or decline it. In this case you need to accept the quest. In the game world you will come across NPC that will offer you various quests. Any time an NPC has a quest his or her name will have the [Quest] at the end of it. You can always type "quest" to start the quest! 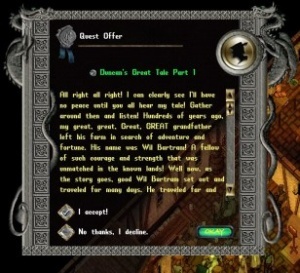 Upon accepting Duncan Bartram’s quest you will notice that in your backpack there is now a blue quest book. These quest books are the current quests that you have. Double clicking the book will bring up useful information about the quest. You can see the quest requirements, the difficulty level, solo or group, and if it has any rewards. There are several types of quests. Kill Quests: Completing these quests requires that you kill things. If you are asked to kill 10 rats simply go find 10 rats and kill them. Each time you slay a rat it will subtract 1 from the total. Once the quest reaches 0 it will automatically complete, the blue book will vanish, you will get any rewards, and you will also get 1 or more Quest Points. Quest Points are used to purchase lots of in game rewards!!! Collect Quests: These quests ask you to collect items. Once you have the items inside your backpack open up the blue quest book. You will see a green circle with the words ‘Collect’ next to you. Click the circle and target your item. This will subtract from the total required items. Deliver Quests: Lastly are deliver quests. To complete a deliver quest take the item in question and drag it form your backpack and drop it onto the NPC. This will subtract from the total required items. To communicate with people on a global scale we use an IRC server. In game you can use the following commands to talk with other players! [c Use this command to chat with other players. [c then 'm' Pushing the ‘m’ next to another players name will let you send them a private message. : (Space) Will let you emote in game. Sounds & actions are worked directly into the emote. For example “: (space) tapfoot” will emote a text and taping motion. Most wearable items in gave will require that you identify them before you will be able to learn anything about the item or equip the item. You can identify an item one of three ways. Item Identification Skill: This is the ID skill. The higher the skill the easier it is to ID something. Item Identification Scroll: You can purchase scrolls from vendors or make them. Item Identification Wand: These wands can be found in treasure chests. Make sure you eat and drink on a regular basis! Over time your hunger and thirst level will slowly drop at a rate of 1 tick per hour. You can view your hunger and thirst by going to you’re My Stats page. An important thing to note is that as your food and hunger levels decrease your skill gain speed will also decrees with it. Meaning if you are hungry and thirst you will gain skill at a slower rate. Additionally, if you become really hungry or thirsty you will began to lose stamina and hit points. Containers like water skins can be re-filled once they are empty. You can double click a water skin and target a water well, trough, or other water source such as a stream or ocean to fill you water container back up with water. Food can be gathered, bought, or prepared via the cooking skill. There are many different cooking tools and ways to make food and often, cooked food will give you buffs! The Hearthstone is a basic recalling device that all character can use every 60 minuets regardless of having skill, scrolls, or wands. Everyone can use one Hearthstone and mark it at a destination of their choice. Purchasable from provisioners double click to claim To mark your Hearthstone to a house single click on the house sign and choose 'bind'. 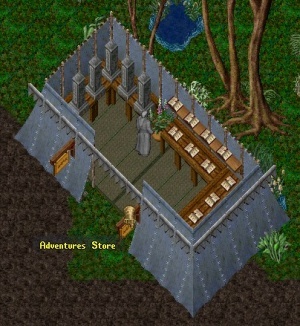 Narrowhaven is the main hub in UO Roleplay and it is a player ran town. 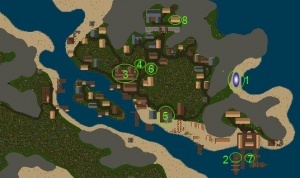 You will find that as a player you can purchase houses and even shops in the town. Below are a few of the major points of interest in the city. 2. Large sailing ship to buy passage to different continents. 3. The Black Fox Inn. A new player dungeon inside the Inn. And new player Quest Board outside the inn. 5. The Hunters Hall: Quests. At this location you can find hundreds of kill quests. 6. Bank. Type 'bank' while next to the banker. 7. Another new player dungeon entrance. Look for the small sail boat. 8. Healer. You can get resurrected at this location. There are currently two new player dungeons in the town of Narrowhaven. The first entrance can be found inside the Black Fox Inn. The second new player dungeon can be found down by the docks. Look for the small boat. How to handle Death and Death of a bonded pet.